In a Tolkenian natural environment, high-fantasy legends were murmuring at our ears, while we drove to the waterfalls on one of the Plitvice Lakes trail. Vibrant greens, algae, moss and a fresh wet atmosphere surrounded us. June 2014, single image, focal length 75mm, aperture f/8, shutter speed 1/60 second, ISO 125, handheld. This very fragile complex of fauna and flora has inspired writers of all times. The story of the Black Queen, who created the 16 lakes after citizens of Plitvice prayed and prayed for rain to fall, that she finally sent thunder and storms until the entire area had become a green lush. Still nowadays it is called the “Devil’s Garden”. I wanted to explore myself this extraordinary scenery, and chose to do so on an next morning, although clouds had developed and rain started to drizzle for a while. The family breakfast that Volodimir served us was far behind already! Diving in the oasis of untouched forest, I felt like I was walking in a real life movie where elves and magic Queens would come out from the frame. The smooth movement of the water falling on the rocks, contrasted with the pinkish and grey skies in the background. 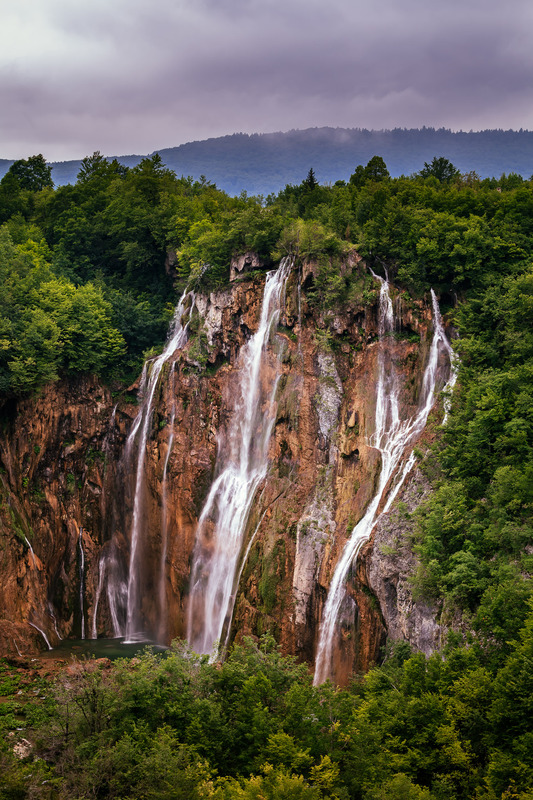 This entry was posted in Landscape and tagged Croatia, Plitvice Lakes.